Markham, Ontario – Mobile convenience is an essential and expected part of today's guest journey. Maestro PMS property software offers operators and guests a complete variety of mobile guest services that begin with pre-registration, pre-arrival amenity requests, mobile check-in, and in-house service requests. Maestro PMS President Warren Dehan said, "We understand the importance of mobile to our clients and their guests. Maestro provides an array of mobile-driven property software systems that streamline operations, personalize the guest experience, and increase loyalty." Maestro's proprietary WebPRO module provides online pre-registration via mobile, tablet, and desktop. This speeds up onsite check-in and provides pre-arrival information to hotel staff. WebPRO also communicates valuable upsell opportunities. WebPRO is an integrated extension of Maestro that includes a pre-arrival dashboard for staff that displays all pre-registered guests for express check-in with real time guest status updates. "Many Maestro properties invite guests to pre-register on their mobile device by including a quick-click link in pre-stay email messages and on their website," Dehan said. Guests may conveniently request amenities, parking information, or airport pickup from their mobile device. If guests choose to check-in early they can confirm payment terms and simply pick up their key at the front desk. "Maestro PMS property software also interfaces with several mobile access solution providers. This enables properties to issue a mobile credential or 'key' before arrival. This gives guests the option to bypass the front desk entirely. Maestro also changes guestroom statuses to 'occupied' when guests first enter their room. This adds convenience for guests and staff." Dehan said, "We know that guests want greater mobile travel convenience. We also understand the importance of guest privacy. 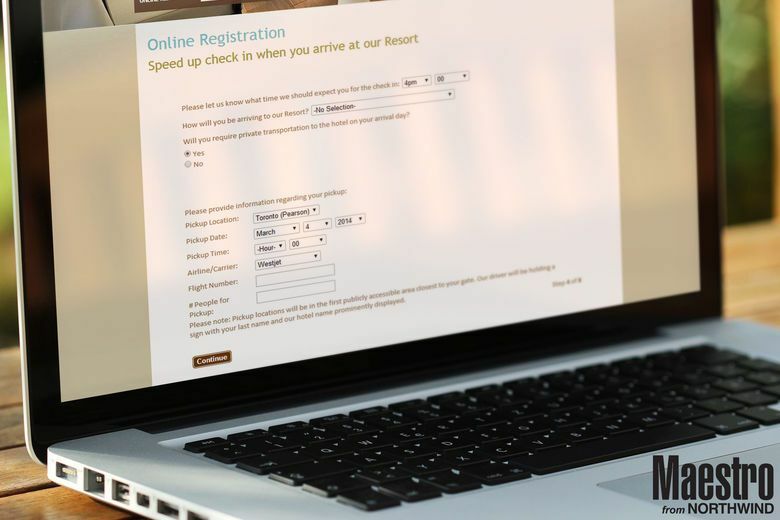 WebPRO allows hotels to collect pertinent guest information relevant to their stay. In addition to recording payment terms, contact information, and arrival and departure dates, WebPRO also provides guests with the property's privacy policies. We give guests the option to receive text or email messages from the property and define the use of their information." On departure day Maestro automatically texts or emails each opt-in guest a message thanking them for their patronage. The message provides a link to review their folio and check-out from their mobile device. "When a guest completes a mobile check-out, Maestro automatically changes their room's status from occupied to vacant dirty so they do not have to stop at the front desk. This creates a smoother guest journey and reduces staff involvement." Maestro's WebPRO pre-registration gets guests to their rooms faster. Maestro Property Management Software (PMS) delivers flexible and scalable deployment options with a feature identical web browser or windows solution available in the cloud or on premise. Maestro's revenue-generating property software tools and services increase profitability, drive direct bookings, centralize operations, and provide personalized and mobile guest service tools to enhance the guest experience. Click here for more information on how to engage and socialize with Maestro PMS. Maestro is the preferred cloud and on-premises PMS solution for independent hotels, luxury resorts, conference centers, vacation rentals, and multi-property groups. Maestro's PCI certified and EMV ready enterprise system offers 20+ integrated modules on a single database including web and mobile apps to increase profitability, drive direct bookings, centralize operations, and enable operators to engage guests with a personalized experience. For over 39 years Maestro's Diamond Plus Service has provided unparalleled 24/7 North American based support and education services to keep hospitality groups operational and productive. Click here for more information on Maestro.